Tuomi, I. (2018) "Dialogical ethics in AI: Towards an adequate theory of agency in the age of machine learning." FTA 2018, Brussels, 4-5 June 2018. How should universities do strategic management, taking into account the profound changes now shaping the context of higher education? This will be published in The FOR-UNI Blueprint: A Blueprint for Organizing Foresight in Universities. Bucharest: Editura Academiei Române, pp. 47-64. Slides from my presentation at NetEffect workshop on innovation networks. In the multifocal downstream model, intercommunity interaction becomes a critical enabler and constraint for innovation. The presentation discusses the different interaction mechanisms and the different types of innovation ecosystem dynamics they generate. Slides from my presentation at FuMee 3 workshop, Paris, 21 May 2010. FuMee focuses on theoretical issues related to anticipatory systems, and is generally aimed at developing concepts and frameworks that help us to understand what is the future and how it plays a role in what happens. 31 March 2010 Mitä opimme Tekesin skenaarioista? What did we learn from the Tekes Scenarios? Slides from my presentation at the Finnish Technology Agency (Tekes) Leadership Forum. The presentation gives some background on scenario work that I did for Tekes with Risto Linturi, Mika Mannermaa, Riel Miller, and Teppo Turkki. This is the abstract and intro of a full-length article in review. 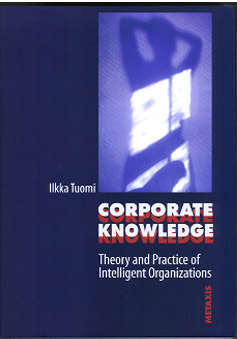 This is Part IV of my out-of-print 1999 book: Corporate Knowledge: Theory and Practice of Intelligent Organizations. The link to the table of contents is at the end of this page. I put the text here as people now and then ask how they could access the book. This section includes, for example, my 1998 analysis of Nonaka's knowledge creation model. Nonaka's thinking has considerably evolved since then, and my own analysis would also look somewhat different today. The section also introduces my 5-A knowledge creation model. References for the book are here. This is a short article that presents four alternative ways to manage boundaries between different local meaning systems: 1) transactions, 2) boundary objects, 3) dialogue, and 4) political processes. I had to write the paper under extraordinary unrealistic super-tight schedule, but it has a relatively decent intro and the main argument should be visible already here. Slides from my presentation at the Edutech "Printed Electronics" course, Tampere. Slides from my presentation at the Gothenburg IT-University. This is a 3-hour 70 slide presentation that both introduces the mainstream theories of von Hippel and Chesbrough and discusses in more detail the foundations of some alternative theories (Nonaka et al. and my own multifocal model). Slides from my presentation at Dipoli, 21 April, Espoo. Most slides in Finnish. Table of contents, executive summary, and introduction to 'The Future of Semiconductor IP Processing Architectures in EU'. The full report will be published by the EC. Slides from my presentation at the 'Visions of Future Computing and Communications Paradigms' session at ICT 2008, 25 November, Lyon. The argument was that in the next couple of years we are about to see a major technology disruption that will create a radically new landscape for ICTs and the Information and Knowledge Society. The new paradigm will be based on low-cost computing and reusable semiconductor intellectual property (IP) blocks that provide configurability and flexible allocation of processing between hardware and software. 2 October 2008 When Innovation Is Hard: Does the Open Source Model Work in Hardware? Slides from a presentation that I gave at the 'Digital Challenges in Innovation Research' workshop at Temple University 26 September 2008, Philadelphia, and at Stanford, 2 October. The slides are from the full version, as presented at Stanford. The study is based on analysis of a few thousand open source projects at SourceForge and about three hundred projects at OpenCores.org, which hosts logic designs for semiconductor virtual components, also known as IP cores. Evaluation report for Tekes on the Finnish participation and networks in the EU 6th Framework Programme for Research. The work was done in a consortium where I wrote the ICT-related parts and the case on ARTEMIS. A short 3-page abstract that summarizes key points of my presentation at the EU eLearning 2007 Conference panel on 'Re-skilling for the Knowledge Society'. The presentation slides are available below. Slides from my presentation at the EU eLearning 2007 Conference, Lisbon. Does the concept of skills make sense in the world of future? Where did it come from? Do we need a more human-centric model for learning, where competences are socially and socio-technically distributed? Slides from my presentation at the JRC-IPTS Exploratory Research workshop on the Socio-Economic Impact of Emerging Social Computing Applications, Seville. Slides from my presentation at the Finnish annual meeting of libraries (Kirjastopäivät), mainly in Finnish. Abstract: The article presents ten theoretically substantiated “theses” on future education and learning, highlighting emerging trends that will shape educational systems. The focus is on the impact of innovation economy and knowledge society on learning. Specifically, the article elaborates the changing dynamics of production models since the first industrial revolution, arguing that in the last few years we have been in the midst of a globalization process that is qualitatively different from the earlier ones. This new model has consequences, for example, for skill demands and their regional distribution. More fundamentally, this “third globalisation” makes innovation the key source of economic value, pushing educational systems from adaptive towards creative learning models. In implementing such creative pedagogies, traditional models of innovation become inadequate. The paper therefore describes recent developments in innovation research, and outlines a new theoretical view on innovation, which connects innovation with social change and learning. This “downstream” innovation model highlights the active and creative role of user communities in making innovations real. As the economic and social importance of “downstream” innovation is becoming increasingly visible, educational institutions and learning activity will change. Policymakers will have to answer the question: Why do we need education in the future? Presentation slides from my keynote at SummIT'07, Odense, Denmark. There will also be some video material available from the conference web site later. The conference was organized by the Knowledge Lab. Most of the presentations on the conference site are in Danish. A report written for the OECD Centre for Educational Research and Innovation. "This report describes ongoing initiatives and underlying concepts in the area of open educational resources (OER). The aim of the report is to elaborate the concept of open educational resources, and provide a practically useful and theoretically solid definition of open educational resources." The link is to the the final draft. The final OECD summary report (Giving Knowledge for Free, OECD 2007) skipped my argument about a Mertonian process for defining such collective contributions, probably because its relevance was not very clearly argued. Social evaluation of contributions is necessary, however. This is because, in my view, knowledge exists only as a social phenomenon. "Contribution" can only be distinguished from a "non-contribution" using social quality criteria implemented in a social process. I use the Mertonian approach to put a social theory of knowledge back into the theory of development and learning, without making extra assumptions about the "truthfullness," "empirical validity" etc., of the contributions. Knowledge, therefore, can be local to a specific culture and social practice, historical, and context dependent, but only if it is validated using the internal criteria available in the social practice in question. That’s how Wikipedia, for example, can distinguish spam and forgeries from real contributions. 10 October 2006 (2 Sep. 05) Meaning Processing as the New Information Society Paradigm. This is a paper written for the EU Joint Research Centre, IPTS, FISTERA project. The full FISTERA (Foresight on Information Society Technologies in the European Research Area) report "The Future of Information Society in Europe" is now available through the JRC-IPTS site. The full report includes also contributions from Emilio Fontela, Jeremy Millard, Carlota Pérez, Luc Soete, Erik Reinert, and John Zysman and Tobias Schulze-Cleven. (The decade(s) of Knowledge Science) Slides from a keynote at the Finnish annual Knowledge Forum. The presentation discussed the past 14 years of knowledge management, tried to summarize what are the new things we have learned, and described some potential future developments. Most of the content is in English. Slides from my keynote presentation at the annual meeting of public broadcasters in Belgium (VRT) and the Netherlands, organized in Mechelen, Belgium. Slides from a presentation at the EU eLearning Conference. Ten provocative theses. 30 May 2006 Observations on the emerging technological landscape and the new media. Slides from a presentation at the VRT Media Morgen: Het Congress. The conference was organized to discuss the future public service contract of VRT, the public broadcasting company of Flemish-speaking Belgium. Summary report written for Hitachi Science and Technology Forum, where I moderated a discussion group on Security, Safety, and Digital Divide. This will be published in a slightly shorter version on the Hitachi Science and Technology Forum site in the near future. 3 February 2006 Meaning Processing: The Next Wave? Slides from a presentation at VTT, Espoo, Finland. 14 October 2005 The Future of Learning in the Knowledge Society: Disruptive Changes for Europe by 2020 Report for DG JRC - IPTS and DG EAC. First Monday asked for a short comment for their special issue on open source. "What, then, would be the most important thing we learned, with the most fundamental impact and consequences in the coming years? Most probably, it is the fact that we need to redesign intellectual property rights." Keynote at "Lithuanian Knowledge towards Global Competitiveness: Lisbon Strategy Relaunched." Vilnius, The link is to the conference program page, where you can find a link to the presentations. Slides from my presentation at the XV Economic Forum. Behind the link, you'll find also the other presentations in the session. The discussion was about the long-wave interpretation of economic development, driven by key technologies. The focus was on Perez's interpretation of the Schumpeterian model and its implications for the development of the Knowledge Society in the new EU member states. Krynica, Poland. Slides from my presentation at the FISTERA Final Conference, Seville, Spain. June 2005 Broadband in South Korea. Report prepared for the BREAD "Broadband for All" coordination action. Describes the history and diffusion of broadband in South Korea. Slides from the kick-off presentation at the High-Level Group on Foresight on Information Society Technologies in the European Research Area (FISTERA) workshop. Asks what new can we say about information society, innovation, globalisation, learning, work and productivity. Presented at Foro de la Innovación y Modernización en Andalucía Málaga, 14 December 2004. The paper complements existing analyses on achieving the Lisbon goals of growth and competitiveness in Europe, and discusses emerging new approaches. A presentation on the development of broadband in the Republic of Korea, given in the BroadBand Europe conference, 8 December 2004, Brugge. The conference was organised by the BREAD Broadband for All coordination action. In the mid-1990s I was developing new methods and tools for distributed knowledge creation and organizational knowledge management. One of the ideas was to merge research on communities of practice and sociocultural theories of learning. My team worked in this area with several leading researchers, including people who were designing new collaboration tools at the Lotus Institute (now IBM). The linked paper was written in 1997. It makes some points that are relevant for the developers of the semantic net, knowledge ontologies, and communities of practice. Slides from my presentation at the IST'04 Conference panel on sustainable productivity growth, 15 November 2004, The Hague. Appears in November 2004 in Framework, as an opening essay on innovation, ethics and social space. "Framework is a discursive forum that opens a space for a variety of visual material, as well as extensive articles, analyses and international commentaries." This was used as a background discussion paper in the revision of the eEurope strategy. Paper presented at the Unesco 21st Century Dialog on "Building Knowledge Societies," Seoul, 28 July 2004. A conference organized in the occasion of the 50th anniversary of the Korean National Commission for UNESCO and the visit of the Director-General of UNESCO to the Republic of Korea. Talks about the historical roots of intellectual property rights and their impact on innovation and social development. The presentation slides complement the text by including material on the social foundations of knowledge, links to social learning literature, etc. The paper examines critically and in some theoretical and empirical detail the concepts and methods of ICT productivity studies. It shows why the current analytical techniques do not allow quantification of the productivity impacts of ICTs, and discusses the reasons why we may need a new productivity paradigm. Working paper written for "Networks of Knowledge: Research and Policy for the Knowledge-Based Economy." Workshop organised by the European Commission, the National Science Foundation, the OECD and the University of Michigan, Brussels, 7-8 June 2004. The workshop papers can also be accessed through the DG INFSO High-Level Socio-Economic Group site. Published in the IPTS Report special issue, June 2004. A concise summary of the main limitations of current methods to analyze the productivity impact of ICTs, written for a policy-oriented general audience. Shows that the observed ICT productivity impact has to a large extent been created by hedonic price indices that have substantially increased the value and growth rate of computer asset estimates that are used in productivity calculations. June 2004Evolution of the Linux Credits File: Methodological Challenges and Reference Data for Open Source Research. The paper also comments a recent Alexis de Tocqueville Institution report that used the working paper version of this article to argue that Linus Torvalds probably was not the inventor of Linux. The Tocqueville report also borrowed my Networks of Innovation, where I studied the history of the World Wide Web, packet switching technology, Linux, etc., and where I pointed out that the conventional inventor model does not work too well for networked and systemic innovations. In fact, contrary to the conclusions made by the Tocqueville authors, I argued that this is one reason why we should rethink the patent system. Historically, it is more accurate to say that Berners-Lee didn't invent the Web (quite accurate) than to argue that Linus didn't create Linux (quite inaccurate). The point, however, is that a careful analysis shows that we need to revise both the concept of inventor and innovation to address software and Internet related innovations. Slides from the presentation at the High Level Group on the Employment and Social Dimension of the Information Society (ESDIS), Brussels, 10 May 2004. A report on the status of the Finnish broadband, up to February 2004. This was prepared for the BREAD consortium. This is the exec summary of a rather detailed piece on ICTs and productivity. The full paper (66 pages) is now available through the DG INFSO Socio-Economic Expert Group site. Slides from my presentation at the IPTS/DG Employment workshop on ICTs and Social Capital, 4 November 2003. In Exponential Growth an Illusion? : Response to Ilkka Tuomi, Ray Kurzweil comments two of my papers that discuss the development of semiconductor and computing technology. Kurzweil used his response in his Accelerating Change Conference plenary keynote 14 September 2003, where we also had a debate on Kurzweil’s hypothesis. The first paper was my First Monday article on Moore’s Law and the latter paper was written as a background paper for the conference (see below). Kurzweil’s comments now give me an opportunity to clarify some apparently confusing points. 1999As my 1999 book Corporate Knowledge: Theory and Practice of Intelligent Organizations is about to be out of print, I'll put here three chapters: Ch 12: Framework for Knowledge Management, Ch 13: Measurement in the Intelligent Organization, and Ch 14: Organizing for Strategic Knowledge Creation. The table of contents and other related information is at the end of this page. This is a working paper that discusses Ray Kurzweil's hypothesis of accelerating rate of technical progress in computing. The paper is based on a set of unpublished papers that cover Kurzweil's argument more broadly, including the claim that technological development can be understood as an evolutionary process. The linked paper focuses on semiconductors and semiconductor industry, but also makes some comments on generic claims of technological change. It provides some starting points for my comments at the Accelerating Change Conference, Stanford, September 12-14, 2003. Paper presented at the COST 269 Conference: "The Good, The Bad, and The Irrelevant," Helsinki 3-5 September 2003. It proposes that we should take social practice as the focus of design of functional (i.e. technological) products. This requires that we build social learning models into design processes. Slides from my presentation at the European Commission, DG Information Society, Brussels, 20 February 2003. The presentation focused on the open source innovation model and discussed the extensibility of this model, as well some potential policy implications. Slides from my presentation at "Social and Human Capital in the Knowledge Society: Policy Implications," Brussels 28-29 October 2002. The conference was organized by the Directorate General Employment and Social Affairs. Related to the theme a couple of complementary papers: Work, Technology and Competence: Aspects of the History and the Future of Work. This was a keynote at the European Conference on Adult Education and Vocational Training, Tampere 18 November 1999. A more general overview of issues on organizational learning and knowledge management is: Learning And Knowing in Organizations. For a recent overview of the history and emerging issues of knowledge management, see "The Future of Knowledge Management," below. This working paper was distributed in Berkeley and Stanford in April 2000. It describes organizational, institutional, economic, cultural, and cognitive aspects of the open source development model. Its analysis has been extended and updated for Networks of Innovation (below). I put it on the net for the US-EU workshop on open source as I mention it in my statement "Open Source for Human Development". 20 August 2002Development of Information Society in Finland: Where it came from, where it is going, and what we mean by "development"
These slides were presented at the kick-off meeting of the ESTO "Tigers" project, August 20, 2002. The included 36 slides describe some basic historical facts and milestones in the Finnish information society development, discuss the reasons why Nokia successfully transformed itself in the 1990s, highlight a couple of challenges, and propose one approach that could be used to evaluate information society development. This came out in Lifelong Learning in Europe (LLinE), vol VII, issue 2/2002, pp. 69-79. These slides were presented at the South Africa - Finland bilateral Innovation Policy Seminar, May 9, 2002, Muldersdrift. This is an extract of my newest book, containing the table of contents and the intro in final draft version. The book came out in November 2002 in Europe and in February 2003 in the US. I often start reading books from the back, trying to figure out where the author is coming from. Here are the references and the name index for the book. Oxford University Press asked me to write a short piece on the origins of the book. It is here, unedited. As the book went to print, I received nice endorsements by John Seely Brown, Manuel Castells, Ikujiro Nonaka and Georg von Krogh. 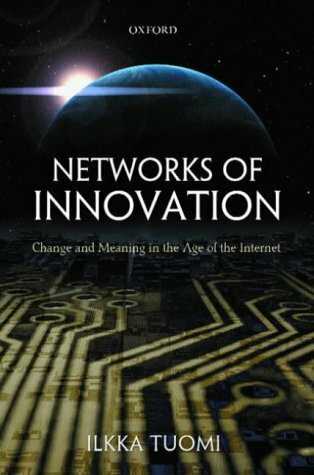 I was also happy to see that Peter Denning, one of the key visionaries of computer science and a past president of ACM noted that it is a "wonderful book..." that " does the best job I've seen in revealing the difference between the idea-model of innovation and the way innovation actually works." The OUP catalog entry is here. Wonder what the title means? This was a presentation that I gave at the final seminar of the Academy of Finland Media Culture research program, May 31, 2002. This was a presentation given at the Helsinki University of Art and Design, for the joint conference of the Humantec and IDIA thematic networks. The presentation starts from a macro-level question: why ICT doesn't seem to appear in economic statistics? It makes a brief "ethnographic" study of Microsoft images that illustrate knowledge work, discovering the most important tool for knowledge work, the social and cognitive coffee cup. I refined some of these ideas also for a presentation at the UC Berkeley Institute for Design / Human-Centric Computing retreat, Lake Tahoe, June 2002. A study where I tried to find information society research topics that today seem peripheral but which could become central in the next five years. This was done as background work for the Finland-Berkeley Information Technology and Society research program. The report is available in paper format from Tekes, the Finnish Technology Agency. Parts of the report are currently being translated to German and will appear in 2002. Inspired by Stephen Wolfram's recent book (see Levy: The Man Who Cracked the Code to Everything) I dug into the depths of my hard disk and recovered an old paper, from 1988. It shows why Wolfram's project can never succeed. The paper argues that only few special types of problems can be solved by algorithmic computer programs and that most natural phenomena fall beyond this class of problems. The paper also describes the starting problem of Turing machines which makes it, in general, impossible to start the computation if the result of the computation needs to have some useful accuracy. The problem with the Wolfram universe, therefore, is not only how to program it, but also how to describe the data it is supposed to operate on. A few comments on Wolfram and the history of the paper are available here. 1999 My previous book was Corporate Knowledge: Theory and Practice of Intelligent Organizations, Metaxis, 1999. Abstract, TOC, and Intro are available here. There is also a wikipedia entry, written by someone who seems to understand what he/she is writing about.